With one more issue to go in the ultimate fan service mash-up no one thought would happen, things are looking up for the Starfleet/Autobot alliance. After the Decepticons and Klingons unleashed a new-look and deadly Trypticon on our heroes, their victory seemed imminently certain. With some quick thinking and Unicron-like skills, Ratchet was able to extract the Enterprise schematics from Kirk’s brain in an effort to modify the Autobots’ answer to Trypticon, Fortress Maximus. With the upgrade complete, not only was Kirk’s mind merged with Maximus, he now transforms into an exact replica of the Enterprise. And thus, Fortress Tiberius was born. While Tiberius keeps Trypticon occupied, the Autobots and Enterprise crew have time to rescue the colonists. The marriage of Kirk’s brain and Maximus’ body was only meant to be temporary as demonstrated by the captain’s struggle to maintain control of him. 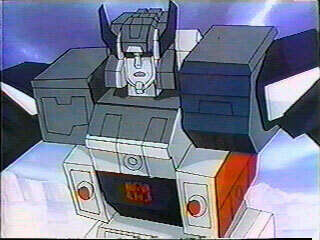 After all, in the Transformers cartoon, Fortress Maximus was piloted by Cerebros, a headmaster transformer that, you guessed it, transforms into the head of the larger robot. Typically, bi-ped organic life forms (like humans) sit in the headmaster suit and take over all robotic brain functions. But because they crash-landed on Cygnus Seven, access to sophisticated Cybertronian technology is extremely limited. Ratchet is forced to jury-rig Kirk to the massive robot with, essentially, loose wires. It’s not supposed to work, but no one ever thought of re-routing power from auxiliary systems to the transporter, intentionally disabling the rematerialization subroutines, and locking the pattern buffers into a diagnostic cycle, either. But that worked, too. As the battle wages on, the traitorous Decepticon opportunist, Starscream, disappears into the dilithium mine. Apparently, dilithium is way more valuable that energon so Starscream, in typical fashion, decides to go into business for himself and steal it. I once worked with a “Starscream,” someone who took every opportunity to try and get our boss fired because she thought she could do a better job than him. She was one of the worst colleagues I’ve ever encountered and, like Starscream, a truly terrible employee. Ultimately, her story didn’t end well and I don’t see it ending well for Starscream, either. After a one-issue hiatus, the flawless Philip Murphy is back on pencils and better than ever. His take on the modified Fortress Maximus is brilliant, especially the way the nacelles are depicted in what reminds me of an homage to another legendary defender. As for the story, once again, Barber and Johnson nail the source material and are able to capture the “Saturday morning cartoon” essence of both Transformers and TAS. The relationship between Megatron and Starscream has always been dysfunctional, and issue #4 is no exception. With a large supply of dilithium in tow, Starscream has now become the most dangerous being in the galaxy and is intent on conquering a whole planet. Now all Starfleet phasers and Cybertronian lasers are locked in on him for a final showdown. So, in essence, he’s now become “the enemy of my enemy” and I love where this is going. Star Trek vs Transformers: Prime’s Directive #4 was released Wednesday, January 16th. It is priced at $3.99. You can order it at TFAW with a discount. The trade paperback collection of all five issues will be released in May. You can pre-order it at Amazon at a discount for $12.81. This looks just gleefully silly! I think I’m gonna order the trade paperback – as long as the pre-ordering bonus makes up for the shipping charges. Otherwise I’m just gonna have to wait.